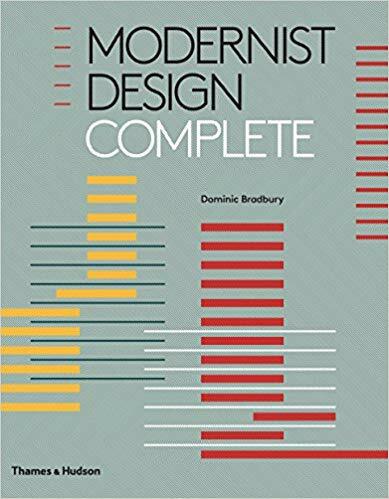 The author's latest book follows the same format as his 2014 published 'Mid-century modern--complete' (also from Thames & Hudson) with highly illustrated chapters about this interesting creative style from the mid-twenties to the mid-forties. The six chapters: Furniture; Lighting; Ceramics and glass; Industrial and product design; Graphics; Houses and interiors more or less covers it all except for fabrics and the various art 'isms' during these years are not included. Each of the six chapters has a brief introduction then an essay followed by mini portfolios, frequently over several pages, of the leading designers and their work. I thought Ann Hoy's essay about streamline America particularly good where she explores the way companies used design to sell products during the depression years in the States, page 212 has a photo of a horizontal Electrolux vacuum cleaner with the inevitable speed lines along the side. The designers in this chapter include Peter Behrens, Harold van Doren, Henry Dreyfuss, Richard Buckminster Fuller, Norman Bel Geddes, Raymond Lowey, Ferdinand Porsche, Walter Dorwin Teague and Wilhelm Wagenfeld. The chapter on furniture, over ninety-five pages, has some beautiful chairs and loungers designed by Marcel Breuer, Eileen Gray, Bruno Matheson, Ludwig Mies van der Rohe, Gilbert Rohde and Gerrit Rieveld though I'm not convinced that his famous Red and Blue chair, which he designed in 1918, is at all comfortable to sit in. Over forty pages the chapter on lighting is the shortest in the book and that, to me, seems over generous for a rather narrowly defined design area but of course it does include some stunning lights especially Donald Deskey's 1928 reverse step table lamp and Poul Henningsen;s amazing Artichoke lamp designed in 1958 (and maybe outside the book's date remit). Houses and interiors (144 pages) is the longest chapter looking at the work of nineteen architects, this is particularly good because of the large interior photos of the houses. The really nice thing about the book are the huge pictures. I mentioned Rietveld's Red and Blue chair, on page ninety-three it's displayed twenty-two centimetres deep, in the ceramics and glass chapter probably many of the objects shown are life size. The back of the book has an illustrated A-Z of architects, designers and manufacturers, bibliography and index. 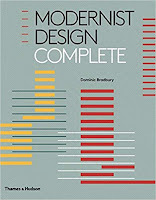 With 'Modernist design complete and 'Mid-century design complete' Dominic Bradbury has written two excellent source books about important creativity in past decades of the last century.